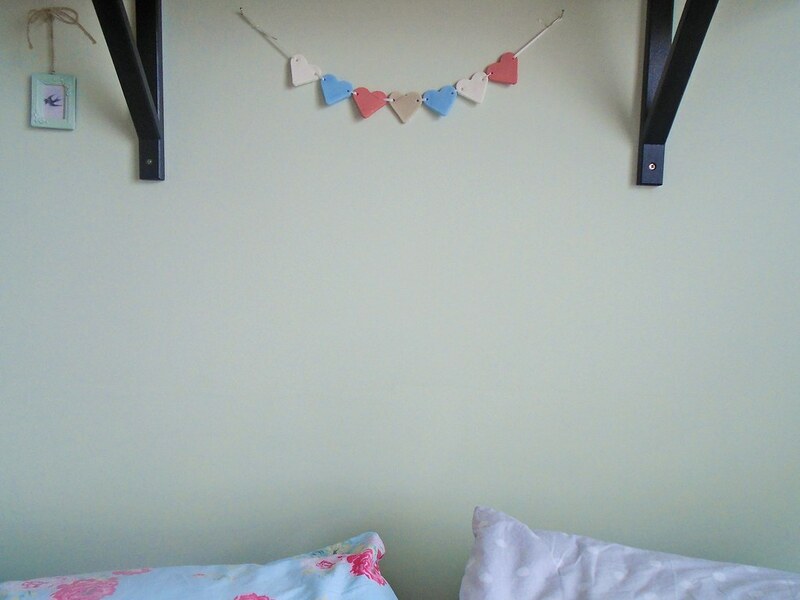 This weekend was a valentines weekend, and I marked the occasion making a little heart garland for our bedroom. In my quest to brighten up some of our bare walls, I decided a little bit of pottery would be grand, and decided a little garland might be just the ticket. Stir together the bicarbonate of soda, cornflour and water in a saucepan over a medium heat until it thickens into a dough (be careful to keep it moving so that you don’t get a layer stuck to your saucepan – although rest assured it soaks off in water no problem – voice of experience!) leave to cool before turning out and kneading until smooth. 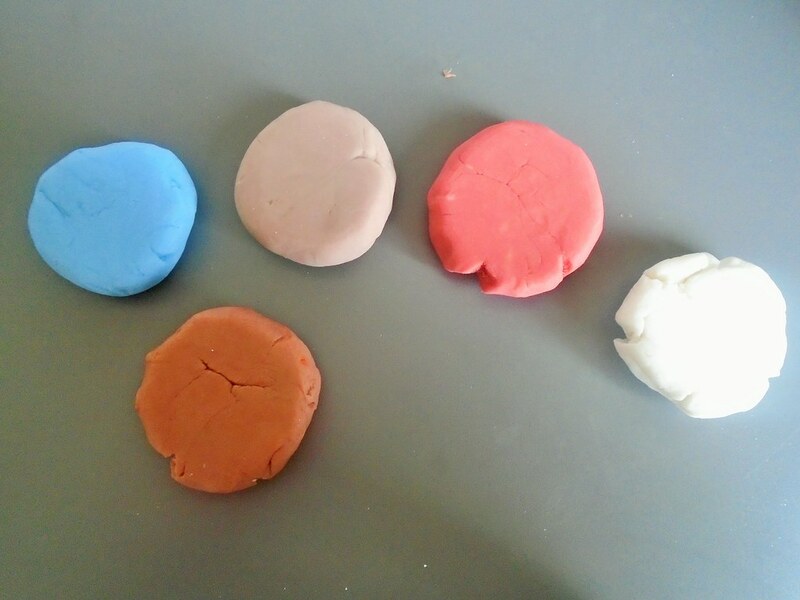 I coloured my clay using food colouring. I used liquid colouring so put some extra cornflour down on the worktop to help soak up the extra moisture and stop me getting into a sticky mess, added a couple of swigs of colour and kneaded again until the clay was an even colour. I had pink, yellow, blue and green colours to use, BUT something very strange happened. I am not sure why, but it might be a chemical reaction to the bicarbonate of soda… the blue was beautiful, but the yellow turned red (and dried a bit pink), the green turned brown (I didn’t use it after all. Too brown.) and the pink turned purple (but then dried beige) So weird! So I made up another small batch to keep white to add to my colour scheme. The next step was to roll out and cut out my heart shapes. I used a freezer bag to roll out onto so that the shapes peeled off easily. I found it easiest to cut out all of my shapes, then peel away the excess from around them first before peeling them off and placing them onto grease-proof-paper on a cooling rack to dry. I put the clay I wasn’t using in bags as realised the surface dries quite quickly and this helped preserve it. Once I had cut out all of my hearts I put holes through them using a knitting needle (I used a double pointed needle so I could thread it all the way through rather than pushing it in then pulling it back – this gave much neater holes) if you don’t have a knitting needle though something like a skewer would work, or even a pen might do it. 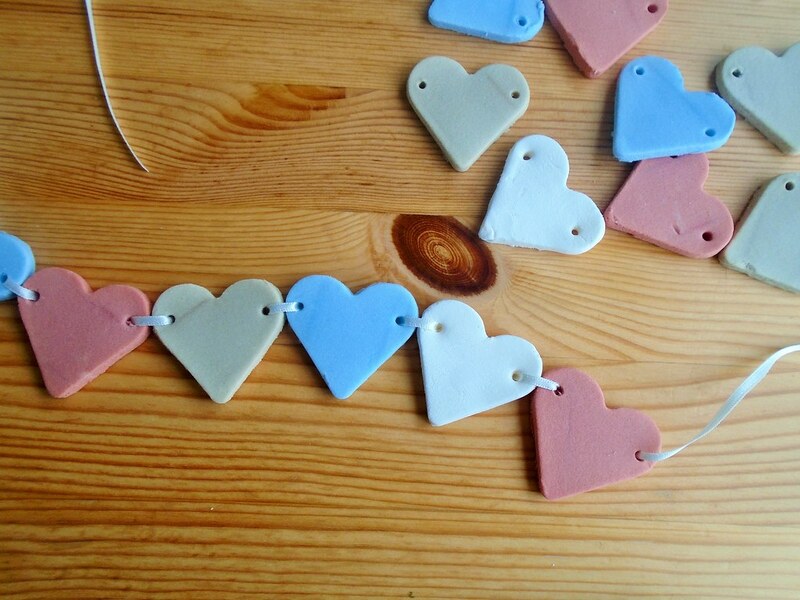 I think my holes are slightly low as the hearts are not quite balanced when they hang (they want to flick out a bit) so it might be worth putting the holes slightly higher to help that. My hearts took about 24 hours to dry well, turning half way, although I think probably another 24 hours to feel they were truely dried out. Once they were dry I used some thin ribbon to thread through and tied loops in the end to hang them. I was initially really disappointed with the colours, really it was just not at all what I had pictured in my mind, but now I have my finished garland and it is hanging in our room, I am really really pleased with it! Accidental colour magic. The colours are really sweet and compliment the colours in our room really nicely. I have recently read the Konmari book, and am feeling very inspired by her message to only surround yourself with items that ‘spark joy’ in you. We’ve started her tidying up method at home and I am getting into the habit of asking myself ‘does this spark joy in me’ – I asked myself when I looked at my little hearts and my answer was yes. 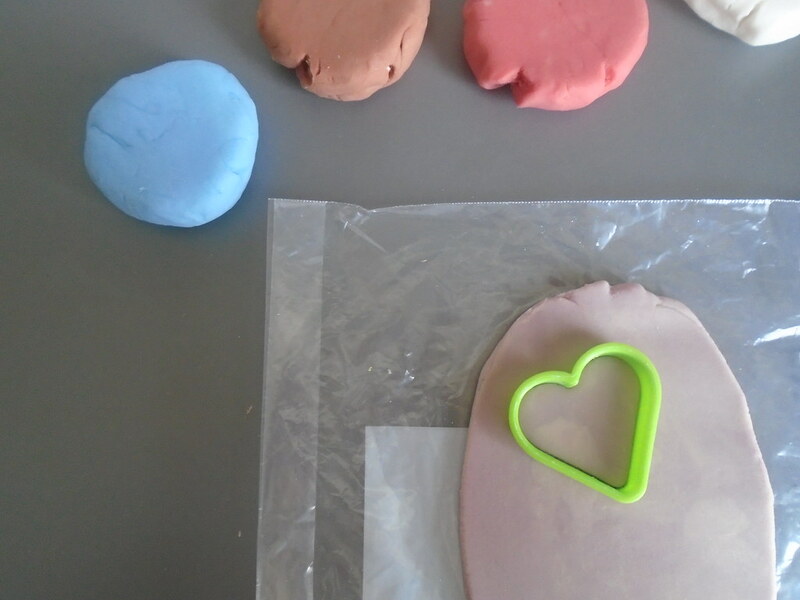 And I still have some of the clay left bagged up in the fridge – I am not sure how long it will last so I might have to think of another project quick!